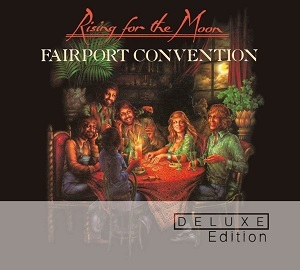 Fairport Convention's 'Rising for the moon' is the latest album to get the Deluxe album treatment, following albums including several Sandy Denny albums which also got this treatment in the last 12 months. As we've come to expect from the Deluxe Edition series, the release consists of two CDs. The first contains the original album plus some bonus content, and the second disc is full of bonus content. In terms of bonus content there are some alternate versions including demo recordings on the first disc, whle the second disc is live recordings recorded at the Troubador in Los Angeles in 1974. In effect then you get the original album, a few bonus tracks, and then a complete live album which is definitely good value given the low price. The album is nicely packaged in a gatefold sleeve containing the two discs and a good booklet with plenty of information to read and its nicely illustrated too. The album was recorded at a time of change for the band. Having left the band several years earlier, Sandy Denny had just rejoined; Richard Thompson had left the band, just one of many lineup changes in the early seventies. The album proved to be very successful commercially, but left some fans disappointed as it wasn't quite what they'd expected. The sound quality here is excellent, and the orignal album really is a great album and folk fans that don't already have it should definitely give it a listen. Fans who already have the album are going to find this a good purchase too - the bonus material makes it well worth buying as you get a full live album plus a few alternate versions of songs, so there is a lot here. A great album that's been given a boost with the addition of lots of bonus material.